It was a busy Sunday for me, so I limited my soccer gazing. Just one TV game: Liverpool-Manchester City. The obvious choice and, as it turned out, an utter waste of two hours. I quickly learned during the TV buildup (first question: why on earth was I listening to that poppycock?) 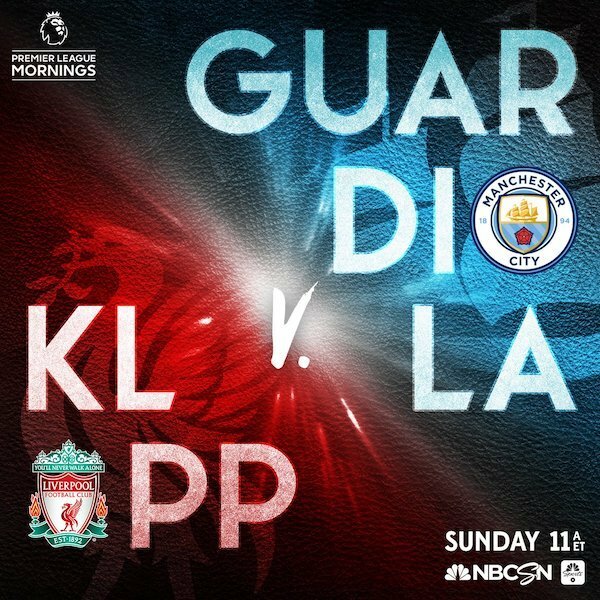 that I was not watching Liverpool vs. Manchester City, which would have greatly interested and excited me, but rather what sounded like a pugilistic meeting, a 1 vs. 1 fight between Jurgen Klopp and Pep Guardiola. The stats were flowing unstoppably. Previous bouts, when Pep had won, when Klopp had won, and the scorelines, which should have alerted me. What I was about to watch, whatever it posed as, was going to be a colossal bore. Simply because the most recent scores being analyzed were 5-0 to Pep, then 4-3 to Klopp. Twelve goals in 2 games? Coaches, in my experience, do not like high-scoring games. They are scared of them. Giving up a load of goals is obviously bad news, but scoring freely also gives coaches grey hairs: Watch it, you’re overdoing it! -- You’ll need some of those goals later! -- as though goals need to be rationed out, with caution. Caution was what we got. These two world-class coaches, both afraid to go for a win, produced a world-class stinker of game. No goals, not even a shot on goal until the 62nd minute -- a feeble effort from ManCity’s Riyad Mahrez (second question: why was I still watching this?). The NBC guys tried to make out this was a game worth watching, while they obviously knew that it wasn’t. Arlo White declared that the first half had been “fascinating,” which was already a huge over-valuation. Rebecca Lowe admitted that the game “wasn’t a humdinger.” Graeme Le Saux and Lee Dixon, both ex-defenders, praised the defenders, an amazing insight in a game that had only four shots on goal and finished 0-0. Anyway, who needs two pro-defender analysts? All that pussyfooting around to avoid declaring that the game was rubbish. Soccer, I believe, has to be something more than an exploitable tool in the hands of the coach. This great Pep vs. Klopp encounter never got off the ground because neither coach wanted it to hit the heights. The analysts can bang on all they like about the complicated tactics employed by the two coaches. Most of their explanations are sheer drivel. You want to understand soccer tactics? The tale of the short blanket will immediately enable you to cut through most of the waffle. On a cold night, pull your blanket up to wrap around your neck ... and freeze your toes off. Push the blanket down -- warm up your toes, but you’ll get the shivers up top. In soccer you pack your defense and you freeze your forwards (though there may, these days, be only one of them) out of the game; play with two or three forwards, and you’ll be “vulnerable” at the back. With that pearl of soccer wisdom you need never again listen to those labored analyses of how a team, if attacking, must be careful not to leave gaps in defense, or how a team, when defending en bloc, can only hope to score from a sudden counterattack. You’ll repeatedly hear those utterly obvious thoughts turned into complicated tactical notions -- just ignore them, think “short blanket,” and you’ll do just fine. (I don’t know where the commendable “Short Blanket Guide to Tactics” comes from -- I first heard of it on a trip to Brazil, many moons past -- it was associated with a Brazilian coach, Tim, who died in 1984). Both Pep and Klopp pulled the blanket up and starved their forwards. Sergio Aguero was subbed off after 64 minutes, Firmino followed just seven minutes later. The two goalscorers, who never got into the game. Because the opposing defenders played so well? Partly that, yes, but also because Aguero and Firmino got the short end of the blanket. They got little support. How could they, when most of their teammates were enjoying blanket coverage at the other end of the field? Martin Samuel, in the Daily Mail, spoke of “two technically proficient teams” that “delivered only disappointment.” The point needs stressing. This game, between two of the best, certainly most expensively assembled, teams in the world was an ugly insult to the sport. What happened on the field did not happen by chance. That both teams were quite unable to produce the vibrant, attacking, entertaining and exciting soccer we were, surely, entitled to expect, was planned, the result of tactics. And when it was all over, when this Klopp vs. Pep battle was mercifully brought to a close, the two much-heralded warriors professed themselves to be highly pleased with the pseudo-soccer they had inflicted on the sport. “I am really happy,” said Klopp. “I’m satisfied -- it’s a good result,” said Pep (third question: Are these guys for real?). Really? Not a word there about the sheer lack of enjoyment surrounding the woeful game that they had engineered. So when ManCity and Liverpool play against the Premier League’s stronger teams -- Chelsea, Arsenal, Spurs, maybe ManU -- we can expect more of this cowardly dreck? Could there be a clearer indication that the Premier League is now divided into the elite few, from whom the winners will always come, and the rest. The brilliant soccer that Klopp and Pep are constantly praised for can only be guaranteed when they bravely take on the likes of Cardiff or Huddersfield. When reality falls so far short of expectation, then it is surely permissible to dream of what could have been. Klopp and Pep throwing their blankets away. Both men willing to show much more faith in their creative, attacking players. A hat trick for Aguero? Another for Firmino? At 3-3, the same result, a tied game. But a totally different game, one to remember, rather than one to forget. That’s an impossible dream in one sense only. That neither Klopp nor Pep would allow it to happen. 6 comments about "We expected a rousing Liverpool vs. Manchester City game. We got a boring Jurgen Klopp vs. Pep Guardiola stalemate". beautiful game, October 9, 2018 at 10:28 p.m.
Much of the game buildup starts with the commentators who generally will call for a shootout affair between offensive teams. Nothing is guaranteed in sports, especially those IQ2 builups. The game speaks for itself and at times a snoozer comes around. Klopp and Pep had nothing to do with the performance by their players; they, the players, for some reason underachieved. It is what it is; why the complaint. Kent James, October 10, 2018 at 8:19 a.m. It is easier to destroy than create, and since scoring a goal and preventing a goal have the same value, most coaches try to take care of the easier part (defense) first. While there can be a tantalizing 0-0 game, I'd argue that's rare. One way to encourage the attack is to award no league points if a team does not score (so no one would get any points from a 0-0 tie). frank schoon replied, October 10, 2018 at 9:50 a.m. This was a disappointing game, decided by how the coaches wanted to play. Both teams played with the "brakes' on. Kent ,to not reward a team by lacking of scoring is not the answer, for I've seen plenty of exciting games ending with 0-0. Remember that game Germany- Austria, WC'82, where both teams were directed not to score in order both would advance to the next round. Phil Hardy, October 10, 2018 at 1:30 p.m.
Dullest match I have seen in quite awhile. Tremendous disappointment. Bah! R2 Dad replied, October 12, 2018 at 5:06 p.m. They're both at the top of the table--these types of match-ups usually end this way. Both sides wre happy with a point. Nick Gabris, November 8, 2018 at 11:57 a.m.
With a young team that has the energy to go the distance, Borrusa Dortmund style would make it most competitive.